Courtesy of Butter Love by L.C. The power of a good skincare routine is severely underestimated and all together misunderstood. Although the [seemingly] best products can be a bit expensive, you don’t have to break the bank for great skin - you just have to be educated on what it needs. When I was a young girl, my father’s mother would stress the importance of taking care of myself - on the outside, as well as the inside. Back then, I hated the thick oily substance she would force my sister and I to rub all over our bodies; but we never had dry skin. I also hated being forced to only drink water; but I was never dehydrated. One thing I did love about grandma’s house, was the plethora of fruit (I didn’t appreciate vegetables back then either) that grew in her and my grandfather’s garden. It hadn’t occurred to me, until recently, that I’ve always had the makings of a “healthy” lifestyle, which is why it comes relatively easy for me. However, we live in a world of false information, and mass produced goods, which makes it difficult to be 100% sure of anything you’re using or consuming - unless of course you do thorough research, or you make the product(s) yourself. Nonetheless, quality products, with minimal and / or organic ingredients are hard to come by. But in the midst of mass production, fly-by-night beauty bloggers / self-proclaimed experts and the sorts, I found Butter Love By L.C. Since October 2014, La'Crassia Wilderness has been working with natural butters and essential oils to nourish, and even heal skin. Her product line consists of bath salts, sugar scrubs, body butters and lip balms. Long before I even had the chance to try her products, I was taken by the way she embodied her brand. From the way she dressed, her scent (patchouli and bergamot), and obviously her smooth skin tone, I knew Butter Love was a way of life. When I finally did try her products - out of sheer curiosity - I was pleasantly surprised. Not only had it gotten rid of a dry patch (within 2 days!) on my stomach that had been persistent all winter long, it smelled nice, made me feel sensual, and lasted me a while! 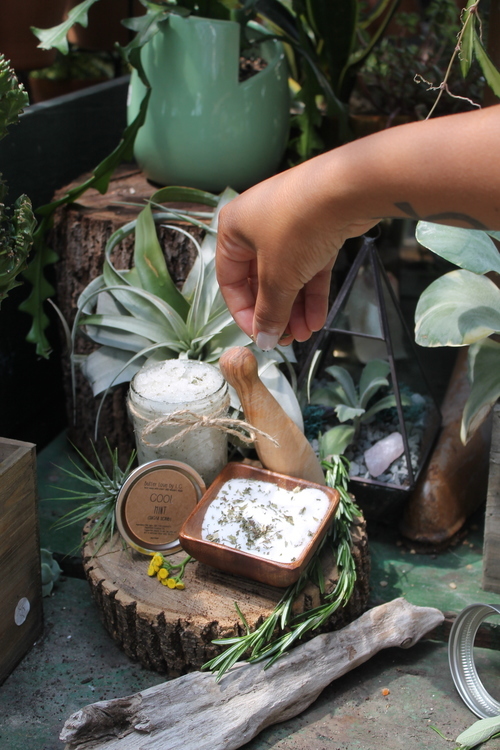 A long way from naively mixing dangerous chemicals in her closet, Wilderness now mixes essential oils and natural butters in a lab, located in her south-city residence. As soon as you enter her home, you’re in a different world. The perfect amount of sunlight seeps through the windows - a health benefit in itself, and the aroma is calming. She immediately made us feel at home by making us tea and taking us on a grand tour. Of course the most exciting part of the tour took place in her lab, where she told us all of her secrets….seriously, she didn’t have anything to hide. After all, it is extremely difficult to recreate such raw passion. The internet has allowed for a vast amount of information to be readily available at our fingertips. You can literally Google “essential oils”, and find out what they are, what they do, where to get them, and more! The only issue is, you don’t know which of these sources are accurate, and which are not. For instance; a few years ago there was this phenomenon about coconut oil being this magical superfood, and for years I used Trader Joe’s coconut oil on my hair and face, not knowing that [the way I was using] coconut oil actually clogs your pores! Not only this, but I had no idea what process was used to make the particular oil(s) I was using! Furthermore, there is no such thing as a one size fits all skincare regimen. So, while coconut oil may work perfectly fine as an everyday moisturizer for some, it may not yield the same results for others. I am in no way bashing coconut oil, or saying that it isn’t useful. Rather, they way in which many people do use it, is wrong - or it just simply isn't right for their skin. In fact, Wilderness uses the essential oil in many of her best selling products. “I use coconut oil as a thinner for my shea butter, so that when you apply it [body butter] to your skin it melts on and deeply penetrates pores, and ultimately hydrates the skin,” she said. If you decide not to go the Butter Love route, experts suggest testing products on a small area of skin before applying them all-over, as well as buying oils that are “virgin”, versus “refined”, in order to get as close to the real thing as possible. But even still, you have to be somewhat knowledgeable about the process used to make the product, because oftentimes the processed used to create a product is what makes it harmful to your body. Fortunately for me, I know exactly where my products come from, and the amount of care put into them. Butter Love By L.C. sources all of their ingredients locally, except for the shea butter, which comes straight from the motherland. Additionally, all of the products are made by hand, and do not contain any ingredients that aren’t organic, or considered natural. Seeing that Wilderness has mastered her current product line, in the near future she has plans to expand the line to include an all natural deodorant (which I am totally looking forward to), enhance packaging for current products, introduce a YouTube Channel, and more! We talked for hours about the ins and outs of skincare, wellness, the moon and the stars. But the biggest take-away from this interview was the reassurance that a bomb skincare routine, the perfect diet, or the greatest workout regimen, is only half the battle. You have to make taking care of your mind and your body a lifestyle in order to yield real results.